Your team is on offense and you make a cut. You get the disc. You’re still more than ten yards from the goal line, so your team can’t transition into an endzone look, yet. A common misconception among newer players is that the best throws are the ones that gain the most upfield yards. This is because when newer players have the disc in their hands, they primarily think in terms of vertical field position. They only look at how far they are away from the goal line, ignoring whether they are on the break or the force side of the field. Horizontal field position is important, too. Being ten yards from the goal line, but with the disc all the way on the force or downwind sideline is sometimes worse field position than being thirty yards out but on the break or upwind side of the field. A huge step to becoming a more mature and effective offensive player is to appreciate the fact that offensive field position has more than just one dimension. Once this realization is made, your notion of what makes a good throw changes drastically. Vertical yards run the length of the field from goal line to goal line, like the hash marks of a football field. Horizontal yards, on the other hand, run the width of the field, from sideline to sideline. Typically, defenses rely on limiting what a thrower can do, horizontally. This is most apparent in person-to-person defenses, where there is a single defender marking you when you have the disc. By forcing you flick or backhand, your mark aims to take away one side of the field, leaving it to the downfield defenders to take away the other side. Every time you or your offensive teammates complete a pass to the force side, you lose horizontal yards — the remaining real estate on the force side shrinks, leaving less space to work with and making it more difficult to complete another force side pass in-bounds. Eventually, you’ll run out of horizontal yards — you’ll be on the force sideline, with only a sliver of field ahead of you available for an open-side throw. In order to make your cutters’ job easier, it is important to also seek opportunities to gain horizontal yardage as you move down the field so that the force-side cutting lane remains large enough to threaten in multiple ways. You can gain horizontal yards by recognizing which side of the field the defense is trying to take away from you — and then moving the disc that direction. When you consider both vertical and horizontal yardage, it becomes clear that the mark of a good throw is how well it attacks both. A throw that nets three yards forward, but goes six into the force side is typically less valuable that one that goes one yard backward, but twenty into the break side. It can be helpful to think of it in this way: your goal, as the thrower, is to move the disc not strictly towards the goal line, but towards the front cone on the break sideline. The more yards you can gain in this direction — which is a combination of both vertical and horizontal yards — is the direct value of any given throw. A hugely important caveat to this is that, in order for your throw to have any value to your offense whatsoever, it has to be completed. This raises an important dilemma for newer players who might not feel comfortable breaking a mark to gain important horizontal yardage: How can you make a throw that will help your team without undue risk? This can be difficult, until you remember that ultimate is a game where one throw can flow into another, with each successive completion building on the momentum of the last to create flow. When the offense starts flowing, it becomes easier to complete other passes that would have been difficult before the first throw. Those passes that open up because of yours add indirect value to your own throw. In this video, UCF, in white and going away from the camera against Carleton’s backhand force, attacks the break side. The handler with the disc, Best, beats Carleton’s recovering mark to toss a flick into the break side to Quinton Warren. Because of this throw, which gains both vertical and horizontal yardage, Warren has an easy continuation throw to a young Mischa Freystaetter near the goal line. Best’s break throw was a solid throw to begin with. However, because it opened up more options downfield, those gains snowball, adding value to the original break throw. The good news is, you don’t need to vaporize the mark to start this kind of momentum. One of the best ways to make a throw that starts momentum and indirectly boosts the value of your throw by gaining both horizontal and vertical yardage is an effective dump and swing. A dump and swing is possibly the most common way to move the disc off the extreme force side of the field, horizontally into the break side, and then vertically downfield. Here, white is forcing backhand, and has put black on the force sideline. The first throw — the dump — loses several yards, vertically, but gains an equal number horizontally. More importantly, it opens a huge horizontal gainer — the swing — into the break side. The swing then translates into break side flow that gets capitalized in the fifteen yard pass upfield that continues to push into the break side. Through a set of relatively easy, high percentage throws, the black team has not only gained a handful of vertical yards, but also moved almost the entire field horizontally, creating a massive force side lane as the team looks into the endzone. As a newer player, directly attacking what the defense is trying to deny you is an uphill and risky battle that might not be a good choice for your team. Understanding that your throw doesn’t have to be the specific one to net those yards is an equally significant mental breakthrough. In volleyball, every spike needs a solid set. You can help your team by providing that set by giving your offensive teammates a throw that will will help your team gain both vertical and horizontal yards multiple throws into the future. 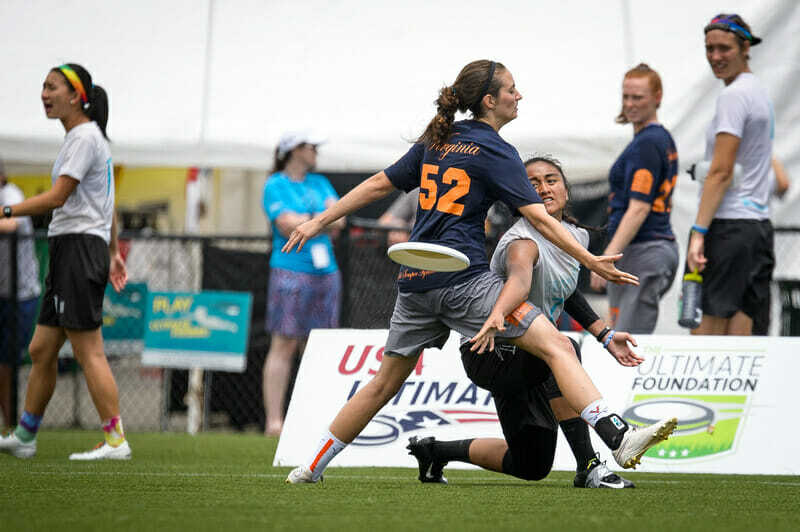 Comments on "Tuesday Tips: Increasing Throw Value, Presented By Spin Ultimate"